THE BEST PARTIES in the world have one thing in common: dip. 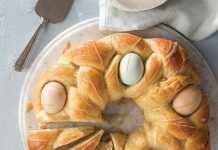 Whether it’s a tailgate party, Mardi Gras bash, or crawfish boil, you’ll find some tantalizing food items just begging to be dipped in a bowl of something equally satisfying. 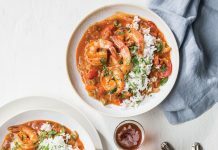 Louisianians have access to the world’s best seafood, so it’s no wonder they love dipping it into rémoulade, tartar, and cocktail sauces. But it doesn’t stop there. Not only is seafood perfect for dipping, it can also make a great dip in itself. Shrimp, crab, and crawfish are often used as the main ingredients in a savory spread, like this smoked tuna dip. Indeed, there are lots of ways to incorporate seafood into a dip of its own, and one of my favorites uses fresh fish. 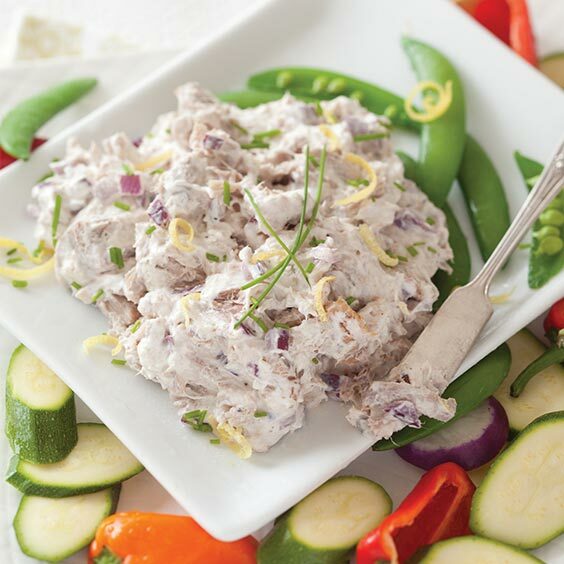 A smoked tuna dip adds a little zest to any Louisiana Saturday night. I take that lovely chunk of ruby red fish, brine it in some of Louisiana’s own Blanc du Bois wine from Landry Vineyards, smoke it, combine it with some creamy and saucy deliciousness, and then scoop it up for snack-tastic consumption. 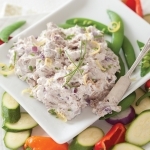 The beauty of this smoked tuna dip is its versatility—you can change it up by using a different fish (smoked salmon and red snapper are both fantastic) or with different creamy ingredients like sour cream or mayonnaise instead of cream cheese and Greek yogurt. Also, make sure you have an assortment of crackers, toast points, and crostini for dipping. In a large bowl, combine wine, 2 cups water, ¼ cup salt, and tuna steaks; cover, and refrigerate for 30 minutes. Preheat smoker to low (225° to 250°). Sprinkle soaked wood chips over coals. Remove tuna, and pat dry with paper towels. Add to smoker, and cook about 1 hour or until meat flakes easily. Coarsely chop tuna, and let cool completely. In a large bowl, combine cream cheese, yogurt, and remaining ¼ teaspoon salt. Add red onion, garlic, zest, black pepper, and chopped tuna, and stir gently to combine. Refrigerate at least 20 minutes. Garnish with chives and zest, if desired. 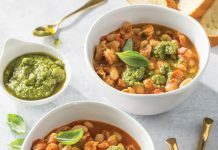 Serve with your favorite fresh vegetables or crackers. A light, dry white wine may be substituted. Hi Clark. Thanks for writing. We do indeed test all of our recipes before publishing, and we had quite different results in our Test Kitchen. If you’d like to email me to discuss what may have gone wrong, please drop me a line at daniel@louisianacookin.com. It’s the worst when you’ve spent money and time on a meal you dislike. — Daniel Schumacher, editor.